Note the speckled underside of this Male Teal. The grey body indicates Winter plumage, Summer plumage would be much browner. The brown and green head is unlike any other UK duck. The Teal is the smallest common surface feeding duck. The Male has a brown head with a broad green band running up the neck and through the eye. Both Male and Female Teal have a Green wing spectrum. 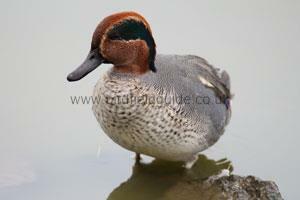 Teal are well known for being 'flighty' and will often fly long before other wildfowl will move. The Teals flight is very fast and direct but they also twist and turn sharply and can be mistaken for waders, especially given their small size. Breeds mainly in the North and East of Europe. Around 2000 pair nest in the UK, most of these birds are resident. In Winter numbers are vastly increased by birds from Northern Europe with 210,000 arriving and spending their winter, mostly in the South of the UK. The Teal breeds on freshwater pools and wet moors including some on high ground. 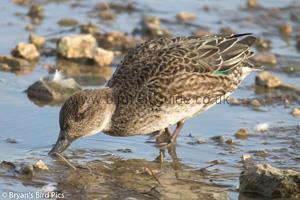 During the Winter the Teal can be found around estuaries and freshwater muddy pools. The female Teal is best identified by it's small size and green spectrum. Although mostly brown the top of the head appears much darker, often giving a 'capped' effect. Note the darker forehead of this Female Teal and the green speculum.